urbanbaby&toddler magazine: It's that Time of Year! Do you remember, as a kid, that tingle in the pit of you stomach as September was rolling in? I do. Both anxiety and excitement, beginning of the school year is an experience like no other. Here’s how to make the best of it. Secrets to make it snappy? Befriend other parents of toddlers. Register for “mommy and me” classes at the community center and visit the local playground. Read books about going to school. “A Pocket Full Of Kisses” by Audrey Penn says it best. Once you decide on a preschool, visit the place a few times so it becomes a familiar site and inquire about meeting the teacher. 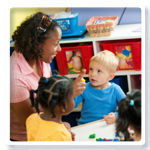 Enroll your child in an “On my Own” class at the local community center. It is a good gradual entry program during she can learn about school routines and playing with new friends. If you are anxious, look for our own silver lining. Rather than being apprehensive, think of it as a celebration of a new stage in your child’s life.